NOTE: This article was first written for the Globe and Mail Careers, Leadership Lab. Ahh, that trust thing – when you have it, everything is good. Without it, so much can go wrong. It takes time to build up trust and yet only a fraction of a second to break it. Every leader will face challenging situations. Navigating change; coping with surprises and/or breakdowns in communications; stakeholder(s) feeling marginalized and/or disrespected – these can all test one’s leadership. 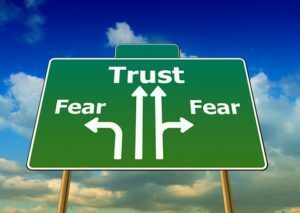 And while some situations are more complex, nuanced and challenging than others, it is during the tough moments when a leader’s efficacy in preserving trust can be the difference maker. People often fail to recognize how significantly a perceived threat can impact one’s ability to think critically, resourcefully, and to connect with others. Conversations are more than words and exchanges of information. Each conversation has the potential to trigger a reaction – emotionally and in our neurochemistry. It takes less than a second for the brain to perceive threat and default to a protective stance both mentally and biologically. Just when one needs the best of their abilities to navigate sensitive and complex moments with open minds, good thinking and collaborative ability, the brain in threat primes for the opposite response – to either shut down and hide or act out with unproductive communications. Leaders must develop efficacy in Conversational Intelligence®. This speaks to many skills including understanding and managing the neurochemical impact and ripple effects associated with their words, conversations and even silences. Conversations have potential to build (or break) relationships, promote (or obstruct) understanding, foster (or impede) trust. An effective leader will recognize their own distrust triggers and be mindful in managing their impact on others. The ideas that follow expand on this. Leaders need to show up and communicate at the right times. In absence of information, people make stuff up, especially when faced with ambiguity or challenge. The lengthier the silence, the more miscommunications, fear and distrust fills the void. While the ways (and what) of communicating differ in various contexts, a fundamental leadership blunder is to be invisible for too long. Showing up doesn’t mean one must have all the answers at once. But a leader must be present and convey the right message for the given moment. Indeed, a leader needs to be thoughtful and often very careful in what they say – especially in highly complex and sensitive situations. While strategic scripts and messaging can be important tools for guidance, overly scripted, inauthentic explanations from a leader can sometimes trigger distrust even in the most well-intended situations. The mastery for the leader is to find ways to bridge the informational message with their authentic voice and values. Conveying candour, concern, and attention in the right moments can help safeguard trust and confidence. A message focused exclusively on factual information – or potentially defensive-sounding explanations – can fall flat or backfire. People need to be heard, understood, and respected. A leader can blunder when their communications style is too heavily weighted toward telling, explaining, and advocating their position – with too little inquiry, empathy, and listening. Dialogue builds trust. One-way conversations with too much “push” can alienate and damage trust. Even if unintended, a leader’s positional influence can trigger the threat response among those with lesser authority. Leaders need to be mindful of this and share conversational power and create safety for others to communicate diverse views. Demonstrating curiosity, listening, and acknowledging other views are all more likely to promote healthier dynamics even when perspectives differ. Getting things done is important but the best intentions can result in unintended consequences when the leader’s focus on the agenda overrides communicating with and showing respect for the people and relationships involved. Leaders who give due attention to both the work at hand and preserving the integrity in relationships will have better mastery of the trust challenge. Leaders can falter. It’s human. Showing humility in these moments can garner trust and demonstrates courage. Indeed, acknowledging mistakes and apologizing can be difficult for leaders in some situations. It’s critical they do this meaningfully and not for the sake of strategy or looking good. Trust needs to be more than just a communications strategy or set of discrete tactics. It needs to be a core value and prioritized in a leader’s mind as it will be an important guide for their behaviour and communications. There are no silver bullets here as there are many ways to build and break trust in any given situation. Showing up, being authentic, and listening are good ways to start. And while scripts and messages can be helpful, they should not replace being a human leader. Eileen Chadnick (@Chadnick) is a certified executive and leadership coach; a communications pro (20+ years of experience) and principal of Big Cheese Coaching and Chadnick Communications in Toronto. Eileen draws from the science of positivity, leadership, neuroscience, emotional intelligence – and Conversational Intelligence®(C‐IQ®) in her work as a coach, consultant, trusted advisor and facilitator. *Eileen Chadnick is trained in Conversational Intelligence® (C‐IQ®). C‐IQ is a Trademark by Benchmark Communications.